you did a great job with the action shots! 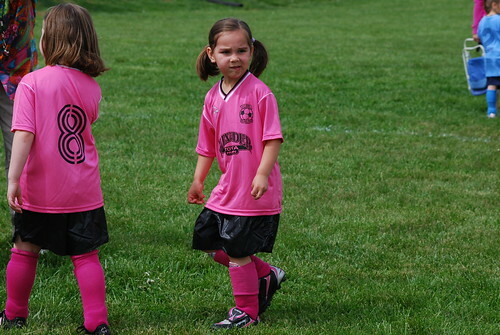 love the pink jersey and matching socks :). 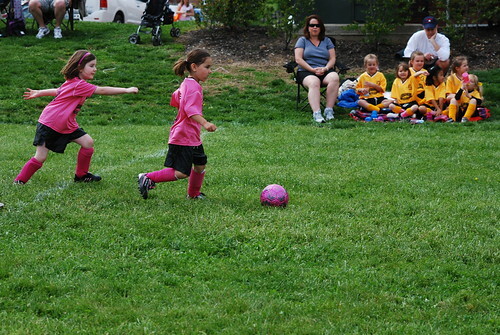 She did a great job Saturday and Aunt Gina was so proud of our SOCCER star! She is so stinkin cute! This is adorable. The pink uniforms? Too cute. 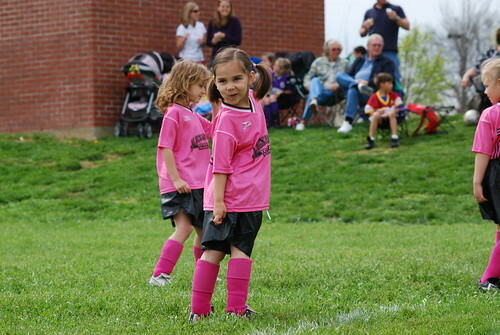 Makes me wish for when my daughter was this age and playing soccer. Loving this series! She's so cool and confident! Love the pink & black uniforms. Mia, our 3 yr old, is starting to get into soccer a little. She loves dribbling up and down the field with her daddy...we're thinking of trying soccer out next fall. How fun! Oh, AWESOME pigtails, too! 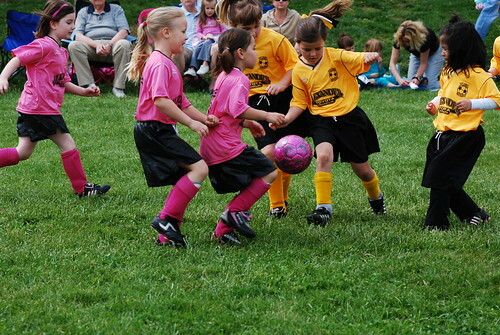 Aw, nothing like playing soccer in pink! I wish my youngest would play because she is my assertive one. What a cutie Harper is. Too cute! Great job with the action shots! she's sweet! Soccer starts around here soon , too. In every photo she is making a different, totally awesome face! You've got a great subject on your hands there! Wow, she's getting so big. Love those pink uniforms! She cracks me up she is so determined. Oh and the pink uniforms and matching pink BALL!!!! This is cute beyond belief. btw: your action captures are very good! Oh my gosh! I love it! I love the PINK! I love her pigtails. I love her spunky expression!! These are great!!! Harpers face in the third shot KILLS me! The pink uniforms are so so cute and you did great on the action shots. What fun for you too! :o) Harper looks so grown up. Yeah Harper! That is great. 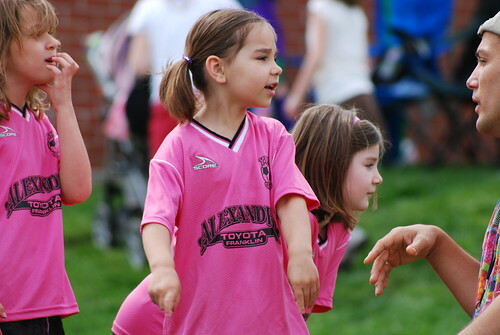 I love the pink uniforms too - Em was so excited when they got PINK as their color last year. But she has decided not to play this fall...I'm kinda sad, but we'll find something to fill it up with I'm sure. 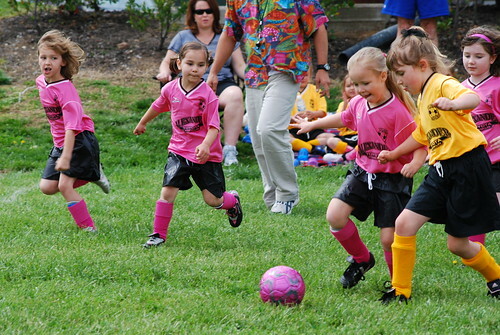 Those are the cutest soccer uniforms EVER! My favorite is shot#3....that face - toooo cute!! These are special shots! I love that their jerseys are pink! I can't wait to get my little one into soccer. He's got about 6 months to go! Very nice captures!!! Assertive & confident - Harper sounds so much like Nadia!! 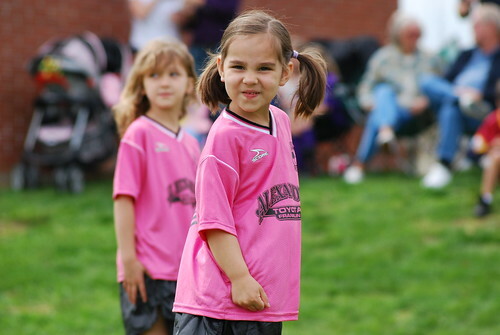 Those soccer uniforms are too cute. Great action shots! I think that my favorite thing is that the soccer ball matches the uniforms! Too fun!